I recently became aware of Souri’s blog Fabulous Femme as she submitted it to my ever growing 40+ community page. As you know I love good photography and Souri’s blog has plenty of that as well as fabulous style. I wanted to know more about both her style and her photography process so time to ask her some questions! I’ve just turned 40! It’s not as scary as people suspect it would be. It’s not like I instantly grew some warts and gained loads of weight as soon as I hit 40! Life’s pretty good here. Can you tell us a bit more about your blog Fabulous Femme and why you created it? Fabulous Femme is a blog which was created to inspire others to live life big and to the fullest. Life’s too short to be mundane. It’s a place where we, as photographers, can express ourselves in any way we wish and to share it with our audience. Our photo shoots always incorporate some beautiful fashion. As we’re perfectionists, it all just has to look great! Fabulous Femme will be an on-going project which our kids can look upon for memories of some great times we’ve had. Hopefully our messages of finding happiness and enjoyment in the simple things in life rub off onto others! The first thing you notice on your blog are the big beautiful photographs. Can you tell me a bit more about your photography? We’re normally wedding photographers. Love everything about weddings! Fabulous Femme pushes us to do other forms of photography. It inspires us to use other techniques and it inspires us to create. Nearly every photo on our blog is ours which we’ve lovingly thought about and taken. They’re too nice not to be shown in large! We’ll produce photos of anything which we deem to be fabulous. 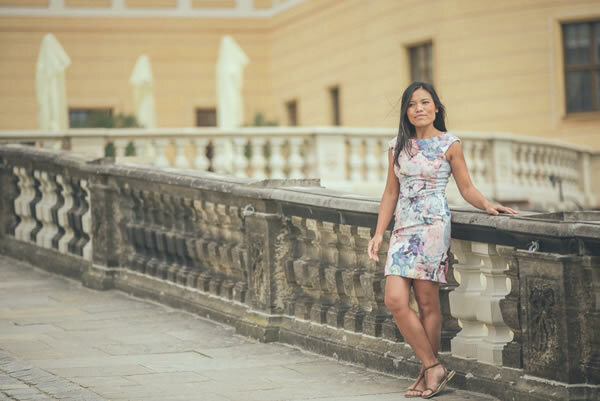 Do you have any tips for other fashion bloggers on how they can improve their photography? You must have a good camera and lenses or have a good photographer! Maybe go and attend a short photography class so that you know how to use your camera properly. You could also take fantastic photos with your iPhone, providing the styling of your photo shoot and the light is great. Lighting is so important! Have good photo apps which allow you to enhance your photos to give them some oomph. There’s so much information online to help you achieve better photos – go and read them! Did I mention good styling? Which camera and which lenses do you usually use for your outdoor fashion photography? The equipment you use for your photography is important … but it’s not everything. As I am a wedding photographer I have the luxury of using professional equipment. I mainly use a Canon 5D III and my favourite lens amongst others is a Canon 85mm 1.2II (which gives you wonderful portraits and does not distort. I love this lens! I could photograph the whole day just with this one lens. When you want to take photography serious for your fashion blog and are on a budget I always would suggest to buy a basic DSLR camera body first – such as a Canon 1100D. Even a used one on ebay. Lenses are really important and for starters I suggest the Canon 50mm 1.8 (which you get for $100 or cheaper). It is a fixed lens which forces you to walk around as you don’t have a zoom … the high Aperture of 1.8 gives you nice background blur. When you caught fire with that combination you can go and spend more money on better equipment (maybe invest in a better versatile lens such as the Canon 24-70 2.8II IS). (My examples are all Canon as I use Canon cameras … but you will find the equivalent from Nikon or Sony … and there are also lots of great smaller mirrorless cameras on the market). Much more important than equipment is to learn the use light and how to compose images. Think about your images before you take them. Take the background into consideration. Try a different perspective and walk around a bit before you take an image. Think different – use reflections, photograph through glass, shoot details, backlight your subject, and so on … there are lots of different ways. Be creative! Photograph every day! Classic, pretty, comfy and fun. I don’t restrict myself when it comes to style. Each day and occasion inspires me in different ways so I’ll dress accordingly. Having two kids doesn’t always allow me to be as glamorous as I’d like to be. Most of the time, comfort wins. I have to feel great in what I’m wearing! The fit has to be right and the style has to be right for the occasion. I’ve seen too many ultra short hemlines at weddings which should have been reserved for a nightclub! Melbourne is a pretty fashionable city! 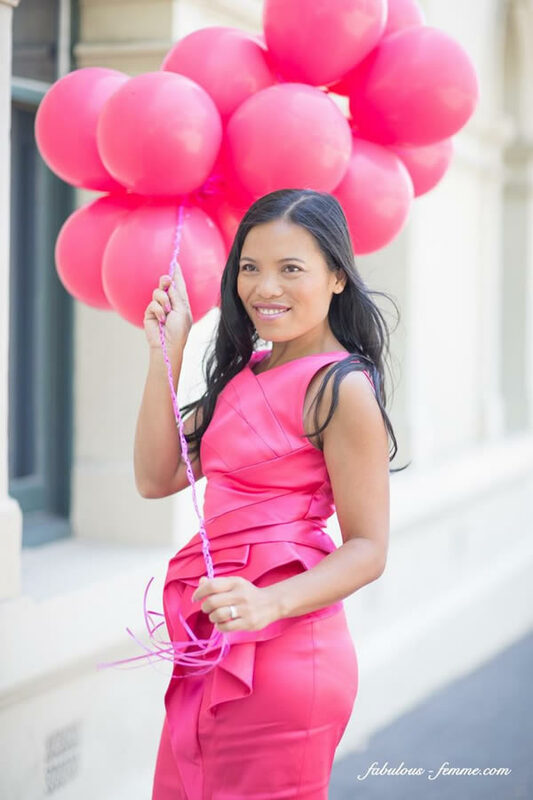 When Melbourne women head out, they’re not afraid to throw on a pretty frock and some heels. Travelling all over Europe, I’m surprised to find that women here prefer to go casual – even in Paris! You can’t be too overdressed for most places in Melbourne. Not really. As I’ve mentioned before, I don’t like to restrict my fashion choices. As long as it’s pretty and I feel great in it. My mood. It also depends on what I want out of a particular photo shoot. I’ll only wear colours which I feel good in and my outfits have to suit my body shape. Not that I’ve noticed. Maybe ask me in my mid forties! My little girl told me that I can wear mini-skirts until my knees are wrinkly. That’s a great piece of advice. Wear whatever you feel great in and it will be appropriate for any age. I’ve been into fashion for quite a while now but having this blog means that I’ve become more selective about my fashion choices. Having been an avid ‘Fashions on the Field’ contestant has helped me refine my style. Those women know how to dress to impress! No leaf is left unturned when it comes to competing in those comps. Everything is immaculate, down to their accessories and hairstyles. The successful person takes pride in every aspect of their lives, including the way that they look. That’s a hard one. There’s so many outfits which I love on that blog! There’s so many more being added constantly. I do love colour and I did love squeezing into that fuschia pink Karen Millen dress (see image on top). 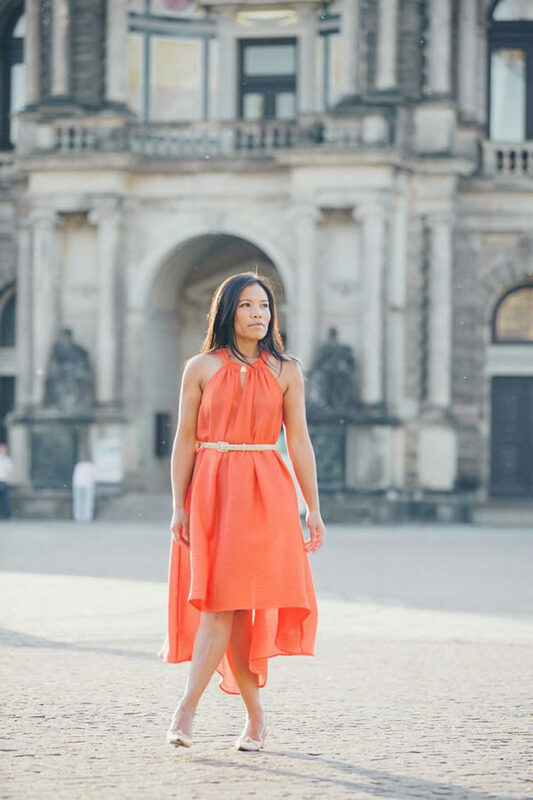 I also loved wearing that orange H&M floaty dress in Dresden, Germany. The black silk skirt and sequinned top at the Zwinger was very chic too! I’m usually not a trend follower, unless it’s the trend towards comfort! Take flat lace-up shoes for example – they are filling up magazine pages! I’ve been living in lace-up flats (Oxfords or Brogues) while touring around Europe. I may sound like a broken record but do wear what you feel great in! It’s not about keeping up with trends or what others think you should wear. If you feel confident in it, wear it! Stick with great fabrics and workmanship and you can’t go too wrong. Cheap fabrics will bring a look down though. We’ll keep filling it up with beautiful photos and amazing happenings! There’s always so much going on around us and we want to capture as much as possible. Some more creative concepts would be great. They just take a lot more time and effort. Have you seen our ‘Mermaids’ feature? That was so much fun but took a lot of time, like all good things. Thanks Souri! 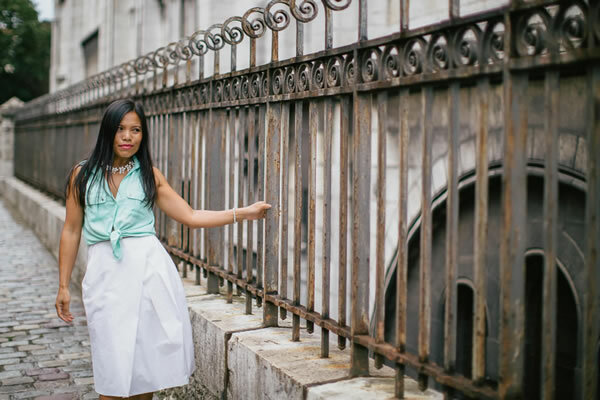 Go check out her beautiful blog and fabulous photos at Fabulous Femme. Oooh, thanks so much for bringing us Souri! I’m really drawn to blogs with beautiful photography, so I’m definitely going to visit Fabulous Femme! The grey dress in the last photo is gorgeous! Thanks for the interview Sylvia … 🙂 It’s always nice when people appreciate my photos and style. What is not to love about this blog? Beautiful. I like all Souri’s outfits. And had a look at the mermaids.. such perfect pictures. The thing about myself which I recognise in her is the fact that all outfits are so different. Not just one style. Love it. Beautiful, I cant afford to travel right now so I enjoy seeing the pictures of other parts of the world. You ladies lead a exciting life. I love Souri’s style. Thanks for sharing.